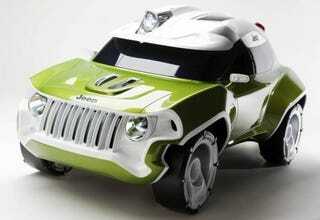 Jeep Pygmy: Fiat 4x4 Of The Future? IED student Basil Kurkova figures , like the rest of Chrysler, Jeep's going to need to adopt some Fiat platforms. Before you grab your pitchforks know this: the Panda 4x4 is unbelievably capable on the dirty stuff. The Fiat Panda 4x4 features a viscous differential that engages the rear wheels when front wheel slip causes the oil to heat up. It's an amazingly simple and reliable system and it's also ideal for hoons, the best way to make progress off road in the little Panda is to floor the throttle and keep it there, no matter what the obstacle. The small size (it's only 62 inches wide and weighs just 2,150 Lbs) also helps, meaning you can go around rather an over obstacles.